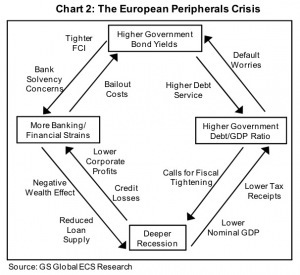 This chart perfectly pictures how the current economic forces and political decisions affect the Euro Zone crisis. Higher government debt ratios lead to fiscal consolidation on the one hand and higher bond yields on the other hand. Fiscal consolidation leads to less economic growth which leads to higher government debt ratios. Higher government bond yields lead to higher debt ratios again. Bank bailout costs lead to higher government bond yields which lead to higher government debt. When banks need to raise more capital they can also decide to lend out less money to consumers, businesses and governments. This will hurt economic growth as well. Something needs to happen quickly to stop this 'death spiral'.